Peters, who is in the Performing Arts class at PCTC showed off her shamisen with great pride. Peters stated a shamisen is like a banjo, but much older. She made this one herself. The shamisen was created in the 1500s. It is of Japanese origin. The banjo was invented in the 1800s. A shamisen has only three strings. A traditional banjo has five. Peters stated she has always been fascinated with woodworking and different cultures. She started her project last fall and estimates she has approximately 80 hours involved in making her shamisen. She used her father’s woodworking tools and ahis guidance in the project. She stated they did not always see the same picture as they worked together, but she is proud of the experience and thanks her father for his assistance (and tools). She estimated she has about $130 wrapped up in building the musical instrument. Peters is proud of the project and and hopes to someday really learn to play this shamisen. She is an accomplished musician able to play the violin, guitar, piano, ukelele, and bass. Also at the meeting, Ashland’s Cody McClurg, who is in the Home Remodeling class at Pioneer showed off a beautiful cutting board he made, He said he enjoys working with wood and learning about the different types of wood that is used in building and making projects. He chose hard maple, cherry and black walnut to make a checker-board cutting board for his senior project. McClurg stated wood is preferred over plastic and glass because wood is easier on blades, has good durability, has less bacteria holding abilities and is easier to maintain. He shared the best care for cutting boards is to always store in a dry area, oil the wood occasionally, and clean every time it is used and dry thoroughly. 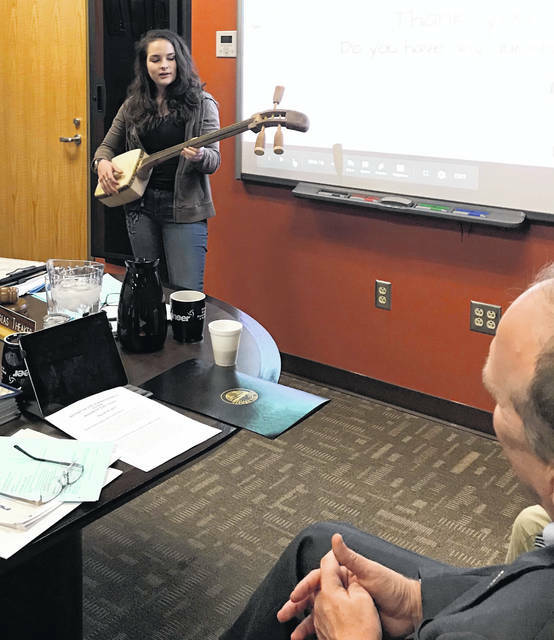 Photo by Janet Kehres Galion’s Karsey Peters, a senior at Pioneer Career and Technology Center, discusses the shamisen she built at Monday’s PCTC board meeting. https://www.galioninquirer.com/wp-content/uploads/sites/38/2019/03/web1_Karsey-Peters-demonstrating-her-shamisen..jpgPhoto by Janet Kehres Galion’s Karsey Peters, a senior at Pioneer Career and Technology Center, discusses the shamisen she built at Monday’s PCTC board meeting.